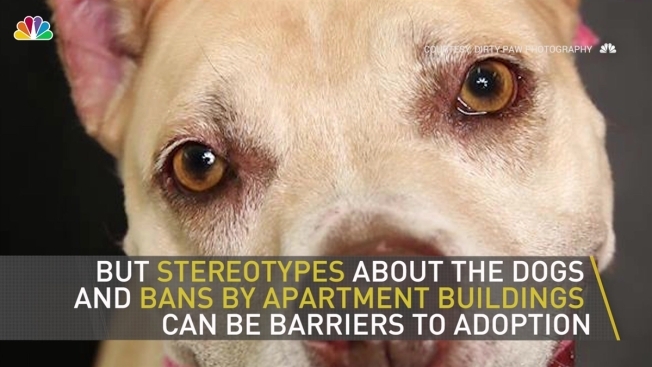 "As a result of prejudice, it is hard to find a home for these dogs"
Many pit bulls in the D.C. area need homes, but bans on the breed by apartment management companies, homeowners associations and all of Prince George's County complicate the search, shelter officials say. When Amy Schindler went to an animal shelter in 2003, she was looking for a little dog. She was thinking her new pet would be under 10 pounds. But she fell in love with a 70-pound pit bull mix and adopted him instead. Schindler, the animal behavior director at the Animal Welfare League of Arlington, urged anyone looking to adopt a dog to keep an open mind, particularly when it comes to pit bulls. "Try to remove any preconceived notions about who you want or what you want, and try to focus on the individual dog," she said. Ahead of the annual Clear the Shelters adoption event, animal experts said preconceptions can be strong as they relate to pit bulls. The category encompasses several breeds of muscular, block-headed dogs, including American Staffordshire terriers, Staffordshire bull terriers and American bulldogs. Shelter officials and rescue organization leaders say it's especially hard to find homes for pit bulls in the Washington, D.C. area because of preconceptions combined with breed bans in apartment buildings, homeowners associations and all of Prince George's County, Maryland. "As a result of prejudice, it is hard to find a home for these dogs," said Tamela Terry, president of the SPCA/Humane Society of Prince George's County (PGSPCA). The PGSPCA is one of several organizations in the D.C. area — including county shelters and rescue groups — that find homes for pit bulls that need to be relocated from Prince George's County. When pit bulls go into the county's Animal Services facility, they must be sent elsewhere. Since 1997, it has been illegal in the county to own, harbor, sell or give away any dogs that "exhibit the characteristics of a pit bull more than any other breed of dog." Anyone who violates the ban can face a fine of as much as $1,000 or six months in jail. Supporters of the ban say it helps keep dogs that are trained to be aggressive out of neighborhoods. Critics say the ban is expensive to uphold and unnecessarily kills dogs that are loving pets or can be rehabilitated. With Clear the Shelters just around the corner, are you ready to adopt? The Humane Rescue Alliance's Lauren Lipsey gave News4 some advice on choosing a pet that's perfect for you. The county shelter cares for, on average, 30 to 40 pit bull mixes every day, making up as much as a quarter of their total dog population, Chief Rodney Taylor said. Rescue coordinators place most of these dogs with rescue organizations and shelters in neighboring counties. But about 15 dogs of all breeds need to be put down every month because of behavioral issues, Taylor said. 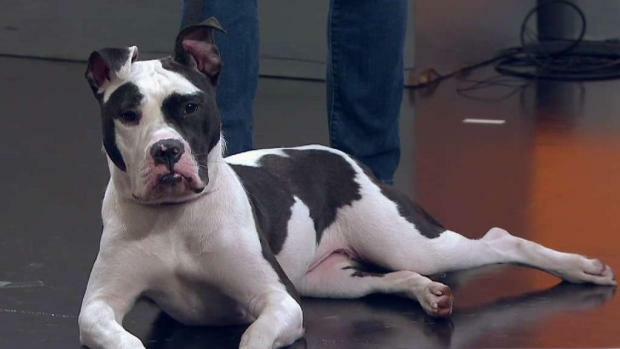 Of the pit bulls that are ready for adoption, the PGSPCA neuters and spays them, and helps find them homes. Terry, the organization's president, blamed irresponsible owners for raising aggressive pit bulls. "People want dogs that look tough and then fail to manage them," she said. Vindicated Pit Bull Rescue, which operates in Northern Virginia, also takes pit bulls from the Prince George's County shelter. President Amy Osterman said some of the dogs show signs of abuse and neglect by their owners. But others are well-trained, even as service dogs. "They're great dogs," Osterman said. "They're friendly, they're goofy, they're intelligent." "But they're still a really misunderstood breed," she added. The rescue group takes as many pit bulls as possible, based on the number of foster homes they have. On Thursday, they had 15, all confiscated from the same home in Prince George's County. The shelter in Arlington County, Virginia, also takes pit bulls from Prince George's County. At the Animal Welfare League of Arlington, pit bulls make up a quarter to half of their total population of dogs. Schindler, the shelter's animal behavior director, said bans on pit bulls by property managers and homeowners associations are the biggest barrier to adoption that they see. If you're interested in helping pit bulls, shelter officials and rescue organization leaders urge you to adopt, foster or donate time or money. Terry, of the PGSPCA, asked residents of Prince George's County to urge their elected officials to eliminate the pit bull ban and instead support "broad, effective dangerous-dog laws." "The pit bulls need all the help we can give them," she said.